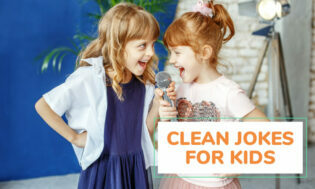 If you are looking for clean jokes for kids to tell at school you’ve come to the right place. 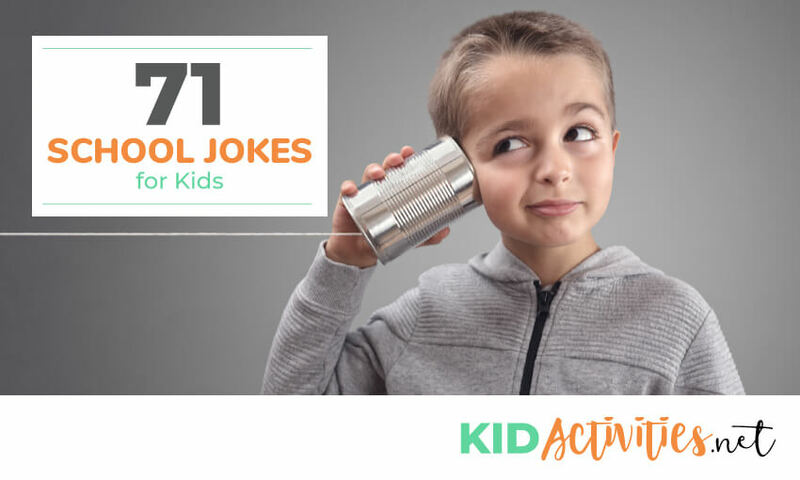 Below you will find 70 funny jokes that will have students and teachers laughing aloud. One of the best ways to make someones day is to get them laughing and these will do just that. Q. How do the fish get to school? Q. 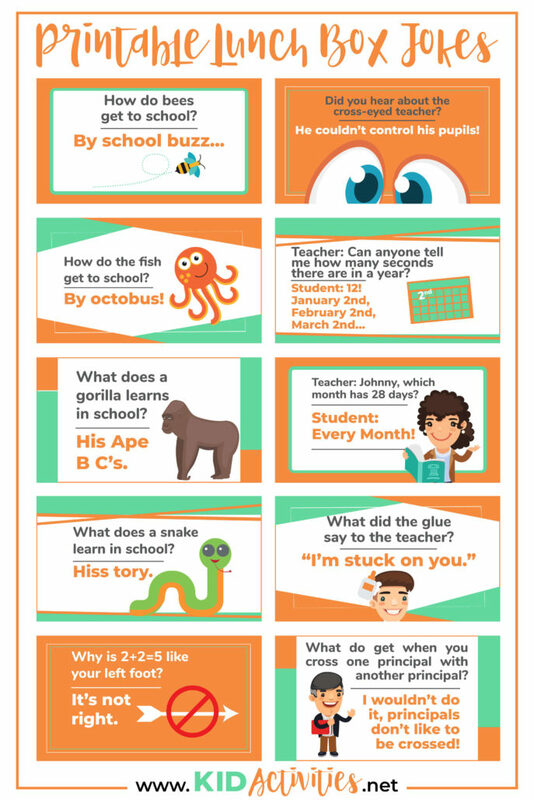 What does a gorilla learns in school? A. His Ape B C’s. Q. Why is 2+2=5 like your left foot? Q. Did you hear about the cross eyed-teacher? A. He couldn’t control his pupils! Q. Teacher: Can anyone tell me how many seconds there are in a year? Q. Teacher: Johnny, which month has 28 days? Q. What did the glue say to the teacher? A. I wouldn’t do it, principals don’t like to be crossed! Q. Why are school cafeteria workers cruel? A. Because they batter fish, beat eggs, and whip cream. Q. What did the ghost teacher say to his class? Q. Why did the students study in the airplane? A. Because they wanted higher grades. Q. Why doesn’t the sun go to college? A. Because it has a million degrees! Q. Why is it dangerous to do math in the jungle? A. Because when you add four and four you get ate (eight). Q. What object is king of the classroom? Q. What do you call a boy with a dictionary in his pocket? Q. Why did the teacher draw on the window? A. Because he wanted his lesson to be very clear! Q. Why did 6 hate 7? Q. Why did the boy go to the top of the school? A. Because he wanted to go to high school. Q. What did the calculator say to the other calculator? Q. Why didn’t the class clown use hair oil the day before the big test? A. Because he didn’t want anything to slip his mind. Q. Why do teachers give you homework? A. Just to annoy you. Q. What’s the difference between a train and a teacher? A. Because the teacher said it was a piece of cake. Q. Why did the boy take a ladder to school? Q. Why is arithmetic hard work? A. All those numbers you have to carry. Q. Where did the pencil go for vacation? Q. Why did the new boy steal a chair from the classroom? A. Because the teacher told him to take a seat. Q. What tools do you need for math? Q. What’s the best place to grow flowers in school? Q. Why was the voice teacher so good at baseball? A. Because she had the perfect pitch. Q. What happened when the teacher tied all the kids shoe laces together? A. They had a class trip! Q. What’s the worst thing that can happen to a geography teacher? A. Because his students were so bright! Q. Where do monsters study? Q. Who sits in front of the class in ghoul school? Dewey have to go to school today? Q. Have you heard about the teacher who was cross-eyed? A. She couldn’t control her pupils! Q. Teacher: Name two days of the week that start with “t”. A. Pupil: Today and Tomorrow. Q. What school supply is always tired? Q. Teacher: I see you missed the first day of school. A. Kid: Yes, but I didn’t miss it much. Q. Teacher: Could you please pay a little attention? A. Student: I’m paying as little attention as I can. Q. Teacher: James, where is your homework? A. James: I ate it. James: You said it was a piece of cake! Q. Teacher: Why is your homework in your father’s handwriting? A. Pupil: I used his pen! Q. Teacher: You’ve got your shoes on the wrong feet. A. Pupil: But these are the only feet I’ve got! Q. What’s the difference between a teacher and a steam train? A. The first goes “Spit out that chewing gum immediately!” and the second goes “chew chew”! Q. Today my teacher yelled at me for something I didn’t do. Q. What is white when its dirty and black when its clean? Q. What do you call a computer superhero? Q. Why did the computer cross the road? A. To get a byte to eat. Q. Who chases computer criminals? Q. What do you get when you cross a dog and a computer? A. A machine that has a bark worse than its byte. Q. Why was the computer so angry? A. Because it had a chip on its shoulder. Q. Why did the computer get glasses? A. To improve its websight. Q. Why did the computer sneeze? A. It had a virus. Q. Where do computers go to dance? Q. Where do cool mice live? 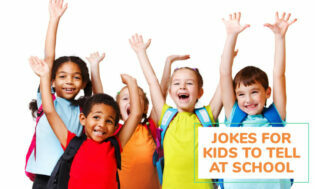 There you have it, 71 hilarious clean jokes for kids to tell at school. If you need even more laughs, be sure to check out the various jokes pages listed below such as crossing the road jokes, thanksgiving jokes, and funny winter jokes. There’s no such thing as laughing too much!